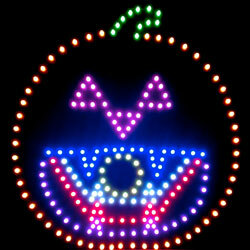 The WowLights RGB Pumpkin kit includes everything you need to assemble an 8 output RGB Pumpkin! Timing is included for 2 RGB Pumpkins in our Halloween RGB Sequences. See Halloween Sequence Layouts for controller setup. Note: A computer running the Standard or higher version of the Light-O-Rama software is required to run RGB Pumpkin timing. Dumb RGB Controller & 8 Dumb Extensions required to control each RGB Pumpkin.